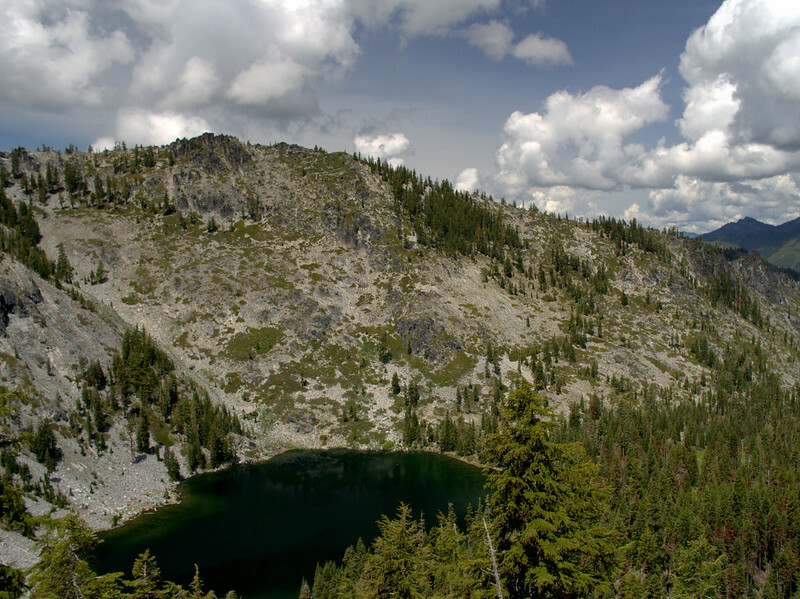 The sharply-defined granite peaks of the central Trinity Alps – like those of California’s High Sierra and Oregon’s Wallowas – seem to be on everyone’s must see list these days. Despite the 6 to 7 hour drive from Portland – and the many folks joining you from San Francisco, Sacarmento, and points south – they are certainly a worthy goal. 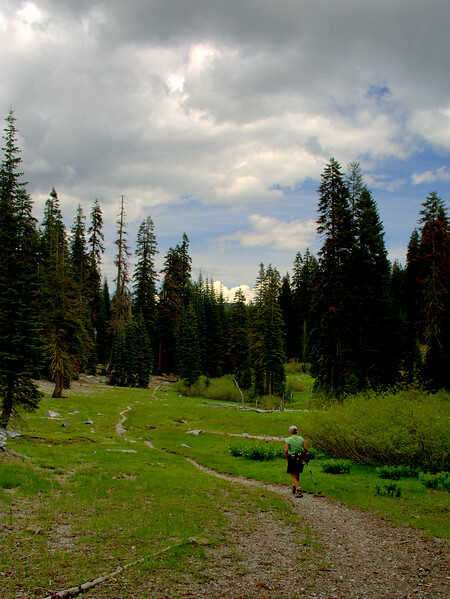 However, there’s more to the Trinity Alps Wilderness than just its center and we went to enjoy a loop hike in the Salmon Mountains on its northern boundary. This area is sometimes termed the “Green Trinities” and was a late addition to the wilderness – so much so that it doesn’t show on some maps of the wilderness! 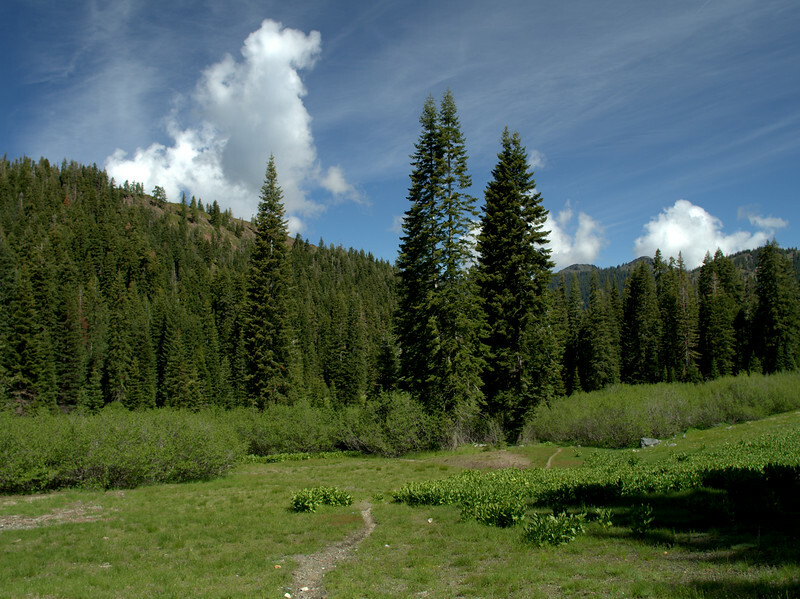 The Trail Gulch to Long Gulch Loop is Hike #26 in White’s Trinity Alps guidebook (5th Edition) and Hike #50 in Lewon’s guidebook (2nd Edition). 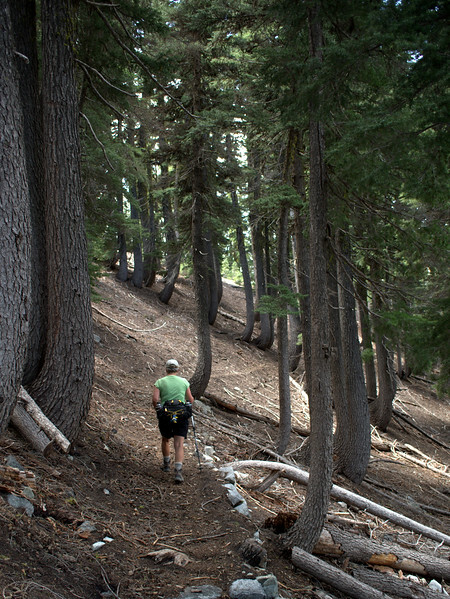 The names of the two gulches were reversed at some point in the past and this error has been carried over to most recent maps and guidebooks (but the Forest Service’s A Guide to the Trinity Alps Wilderness map (2013) is correct). 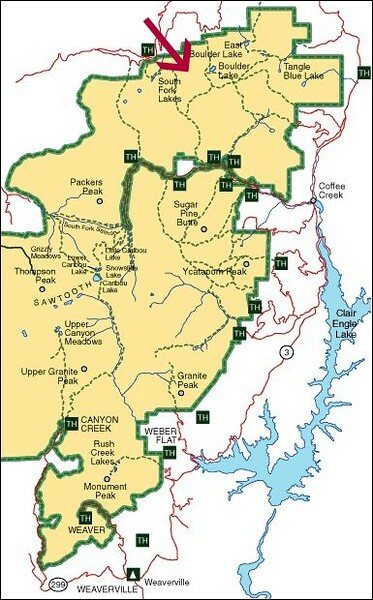 So, just remember that Long Gulch is actually west of Trail Gulch. The entire drive to the Trail Gulch Trailhead is paved, except for the last two miles, which is good gravel. From there, the Trail Gulch Lake Trail (USFS #5502) starts as a long-abandoned road and then becomes more trail-like as it enters the wilderness and begins passing through some wonderful meadows sporting new corn lilies. 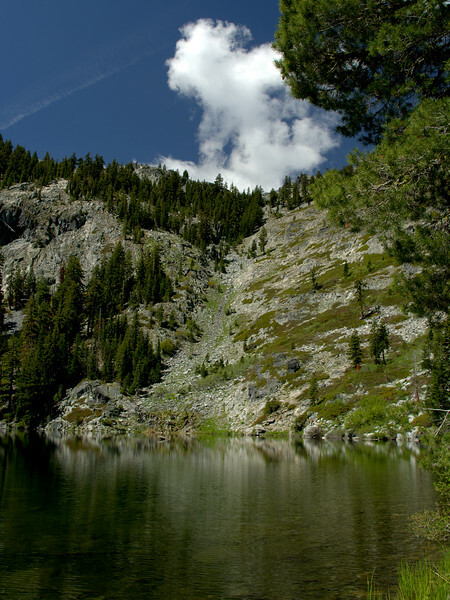 In just two miles, we reached the side trail to Trail Gulch Lake, took it, and were soon at the lake itself, a waterbody set in a cirque of dark granite. 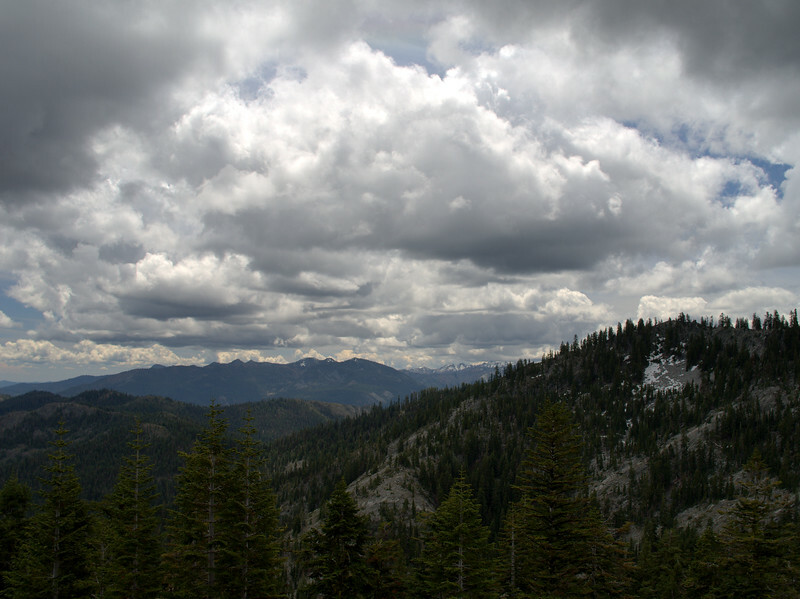 After gazing at the lake, we returned to the main trail and started the moderate climb up to the divide, all the while keeping a wary eye on clouds building over the valley. to the divide, from where we got a good view of Trail Gulch Lake below (and those clouds above). 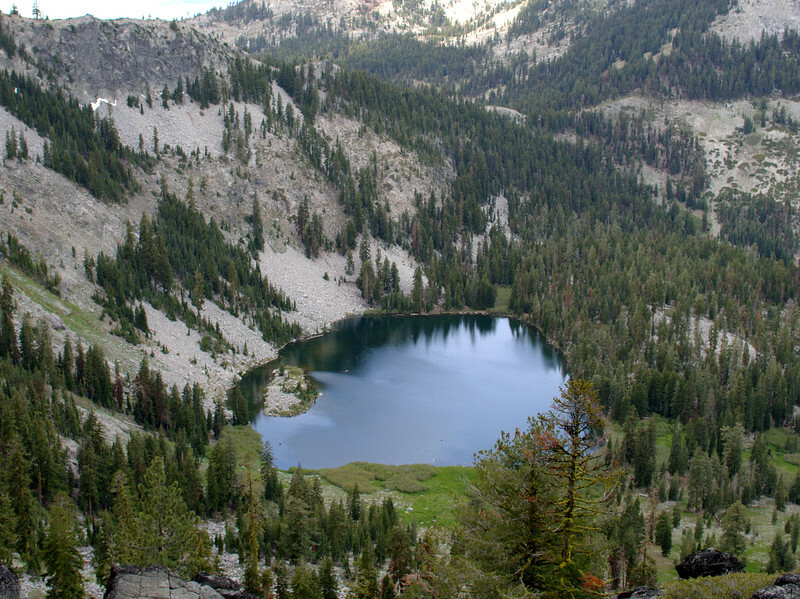 From the divide, you used to have to descend into and then climb out of the Steveale Creek Basin in order to reach Long Gulch Lake. 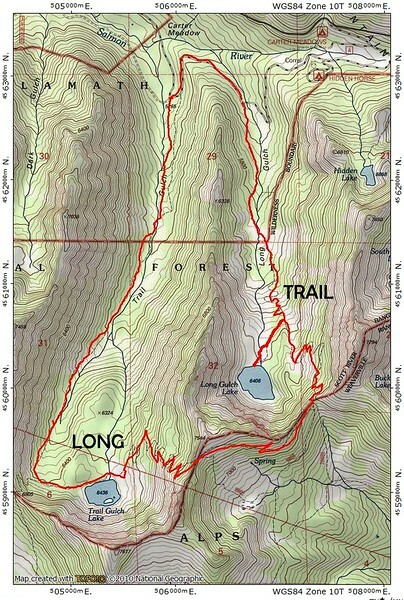 Fortunately, a trail (USFS #5503) was constructed along the south side of the divide in the late 1990s that allows you to make the connection as a contour. 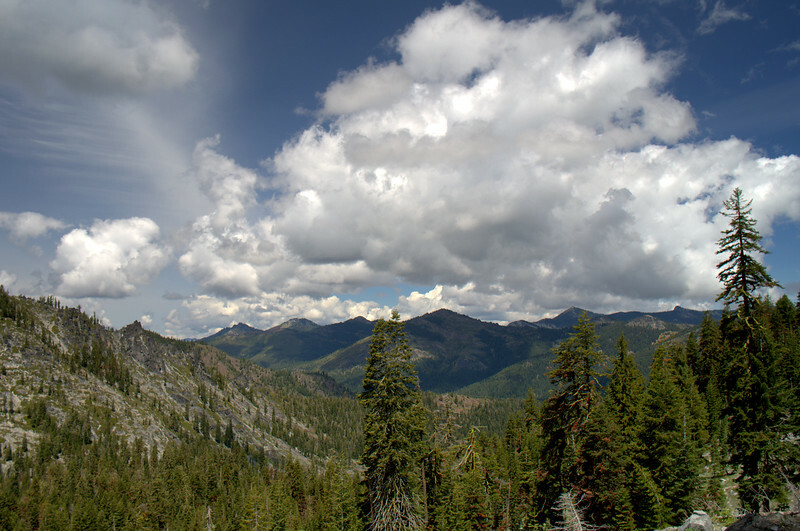 From the divide, we could look south toward the granitic heart of the wilderness, noting the snow still clinging to the heights above 7,000 feet. We also noted the increasing clouds. 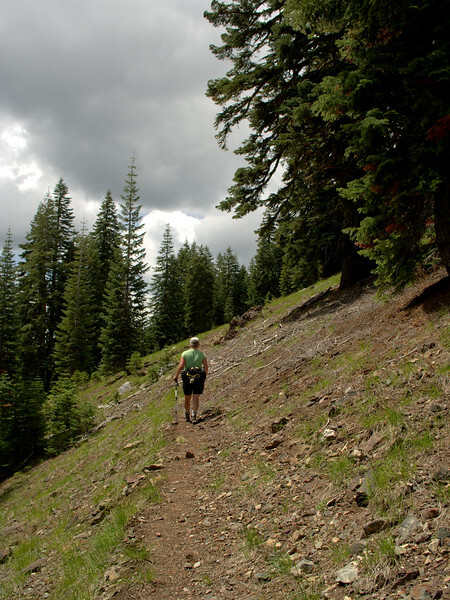 After about a mile, we came back to the divide and to a junction with the Long Gulch Lake Trail (USFS #5505). 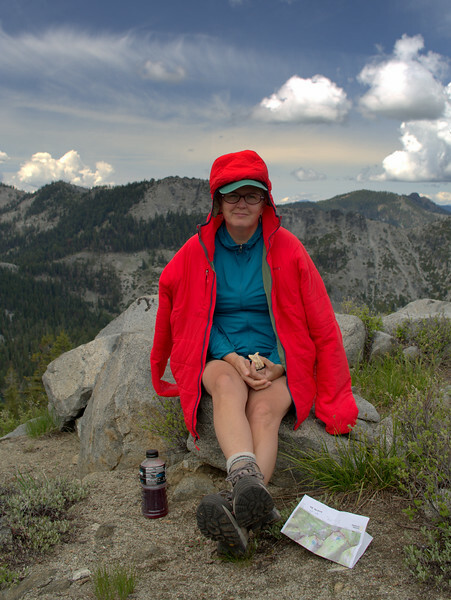 We had lunch on the divide, where, due to a light breeze, cloud cover, and a 7,500-foot elevation, it was a bit chilly – which allowed me to cajol The LovedOne in to accepting the retro chivalry of my nano puff jacket. After lunch, we took the #5505 down to Long Gulch Lake, which is set in an even larger cirque than the one around Trail Gulch Lake. Down by the lake, we encountered a sign which seemed to capture the confusion as to which lake is where. 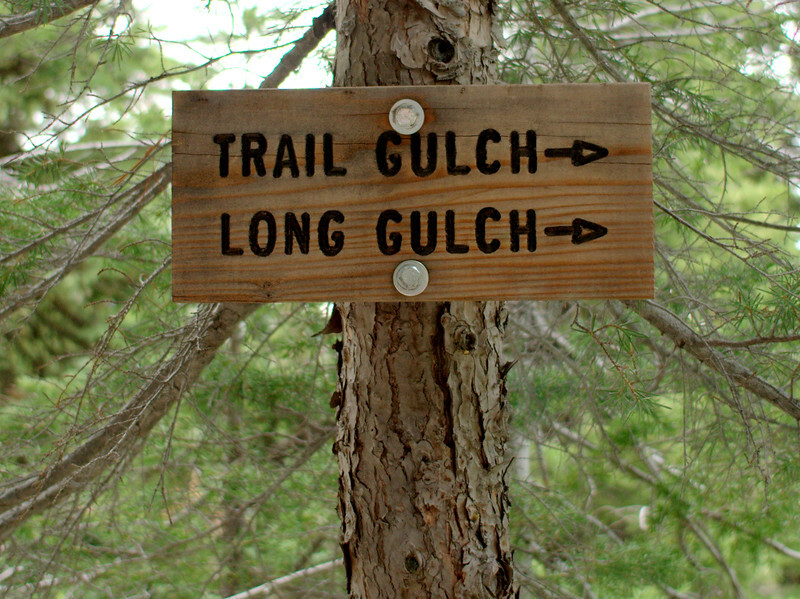 to the Long Gulch Trailhead. There’s supposed to be a new trail (USFS #5513) connecting the Trail Gulch and Long Gulch Trailheads but we missed it and just walked up the road (Forest Road 39N08). 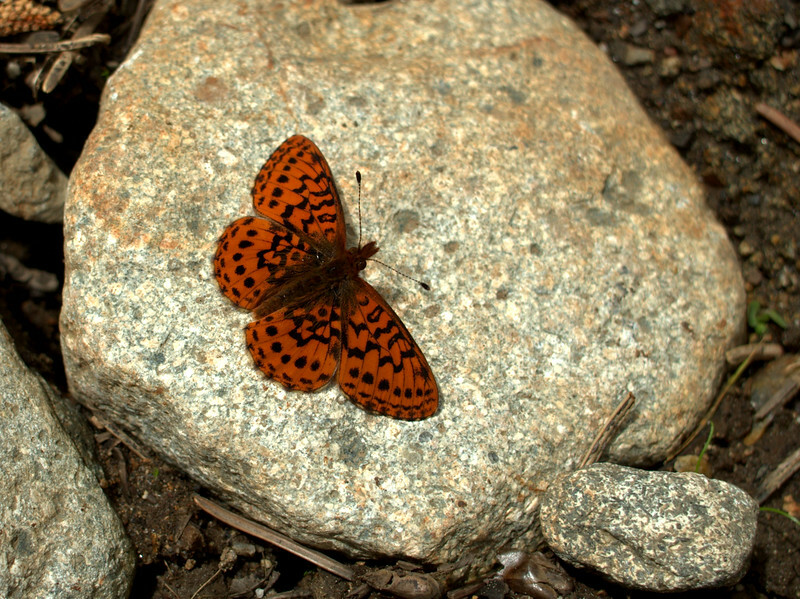 A short hike (9 miles roundtrip; 1,900 feet of elevation gain) through a very pretty area. The hike’s shortness proved to be a good thing, because 30 minutes after we got to the car, the clouds finally gave forth with a mighty deluge. For us, this hike has several plusses: closer to Oregon; much less crowded; plenty of campsites; opportunities for 2-3 day loop backpacks; fishing. And a few minuses: some cows (grazing is allowed – seemingly a concession to ease the path to wilderness designation) and not the central, granitic, iconic Trinities.